According to the doctors at the Women to Women's Healthcare Center, heavy menstrual bleeding (menorrhagia) occurs when a woman soaks a pad or a tampon every hour for several hours or bleeds for more than a week and a half each month. If a woman soaks through two or more pads or tampons an hour, this is generally considered hypermenorrhagia. Heavy menstrual bleeding may be caused by a hormonal and/or nutritional imbalance resulting from diet, lifestyle or stress. Many women experience normal heavy bleeding at some point in their lives, but if your menstrual period lasts longer than 10 days, your menstrual flow consists of large blood clots, heavy periods interfere with your regular lifestyle, you have constant pain in your lower abdomen, and you are abnormally tired or short of breath, then you may be suffering from heavy and/or irregular menstrual bleeding. A balanced diet, a daily exercise routine and a variety of herbal remedies can effectively treat heavy and irregular menstrual bleeding. Raspberry leaf is a medicinal herb used to alleviate menstrual cycle discomfort. Raspberry leaf tea appears to tone the uterine and pelvic muscles. This herb acts as an astringent by stopping excessive bleeding and calming cramps during heavy periods. 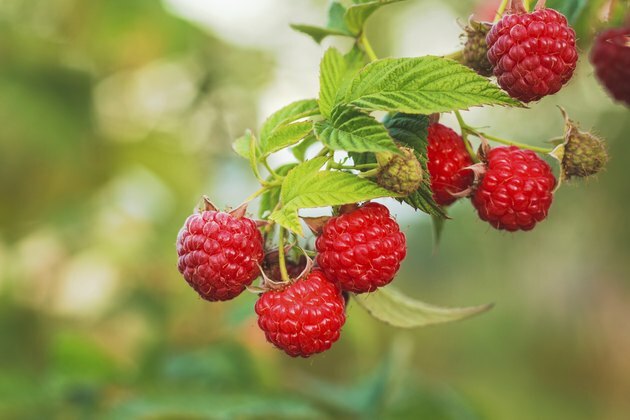 According to "The How To Herb Book," raspberry leaf strengthens the wall of the uterus, supports the entire female reproductive system and decreases profuse menstrual flow. The website Annie's Remedy states that lady's mantle is used to treat menstrual irregularities and difficulties. Its rich concentrations of tannin make it especially valuable in curbing heavy or excessive menstrual flow. Lady's mantle is found both in the wild and in cultivated gardens. Traditionally, Native Americans considered lady's mantle a "woman's healing herb." It contains salicylic acid and has sedative properties that help to alleviate cramps and painful menstruation. Shepherd's purse can be used to help stop excessive menstrual bleeding by gently regulating the menstrual cycle. As an astringent and a uterine stimulant, shepherd's purse helps to stabilize hormone function and reduce menstrual flow. Yarrow can reduce heavy menstrual flow if taken during a heavy period. According to the website BHRT Resource, yarrow contains compounds called tannins, which constrict blood vessels. BHRT Resource states that taking yarrow several days before a menstrual cycle lessens the amount of menstrual flow and prevents cyclic hemorrhaging. Sage can be beneficial in treating irregular menstrual bleeding. The NutraSanus website states that herbalists have long used this herb to treat heavy menstrual bleeding. According to the Association of Women for the Advancement of Research and Education, garden sage contains antispasmodic oils and tannins that prevent sweating and provide relief from pain and excess bleeding. Sage promotes estrogen production and may lower hormonal surges during the menopausal years. Cinnamon bark reduces menstrual flow and relieves uterine cramping. The Viable Herbal Solutions website states that cinnamon bark is a potent antibacterial, antifungal and uterine stimulant that helps relieve menstrual bleeding and cramping. Cinnamon bark is used as a treatment for uterine disorders, as well as for irregular and painful periods. Agrimony is used to stop excessive menstrual bleeding. According to the midwives at Moon Dragon Birthing Services, the natural astringency of agrimony has been effective in stopping bleeding and bruising by promoting blood clotting.